I have been having WAY too much fun at the Better Homes and Gardens website...do any of you ever visit their site? I admit, I do get a little annoyed sometimes at how many times I have to enter in my password and say no, I don't want the magazine because I'm already receiving it! But if you can get past these annoyances (and I intend to) you can find so many new and creative ideas! :) As you know, we have been working on our kitchen, and it has been A LOT of work! But I am excited when I think of the end result! I have been looking at kitchens at BHG, especially trying to find the vintage looking ones. I love the bead board in this kitchen~ something we are definitely going to add between our cabinets and counters! :) Aren't these colors of red and green with the crisp white beautiful together? 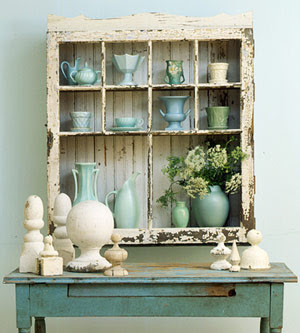 I love how they used an old window to create this adorable china cupboard! 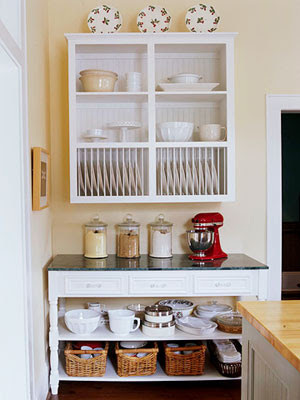 I may have to copy this idea somehow...wouldn't this also make a cute potting shelf? Hum...will have to further contemplate that! Well, that's all for me, or I truly will fall asleep on this computer! It has been a LONG day here, and tomorrow we leave for the weekend! I am going to hopefully do a little post tomorrow before we head out, but in case I don't~ Have a very Happy Memorial Day weekend! :) Are you doing anything special to celebrate, or maybe just taking it easy at home? If you are doing the latter, I am SO jealous! I am such a homebody, it's not even funny! I just love being at home, plain and simple. My family loves vacations, though, so I have to compromise on this, of course! But we will make wonderful memories, I know! :) Take care you all! 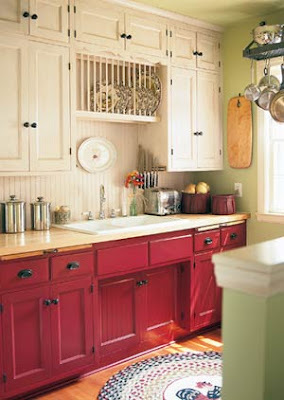 beautiful kitchens, red is my fave colour. Have a lovely weekend Jenni, we are celebrating my birthday on Sunday and it actually talks of being SUNNY! 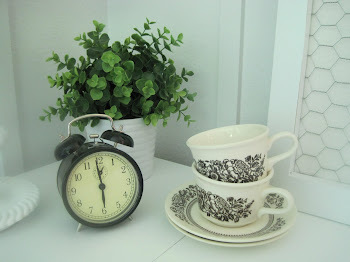 jenni, i know your house will look dreamy when you're done with it because your creative and you got this pretty inspirations to get idea from. oh, leave home sometimes as it will always be there when you comes back. but moments with the family have to be created. so go girl and enjoy your weekend! Jenni, the pictures are beautiful! What I woudln't do to sink into the picture and wash some dishes in those brand new sinks! Those kitchens are really pretty! I'm sure yours will turn out great! I hope you and your family have a safe and fun vacation. We are off Memorial Day and will be staying home. 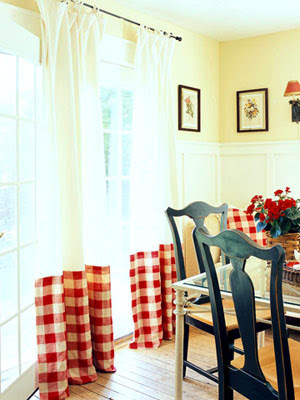 I love Better Homes and Gardens site. I found my new dish from them. I can't get enought of BH&G!! I can't wait to see what your kitchen is going to look like. You have great taste! I wish I lived in that first picture!!! 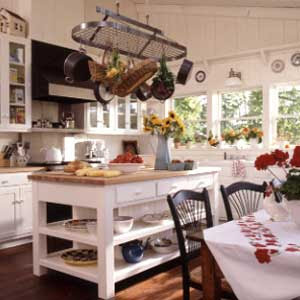 what good ideas... love kitchen ideas! We're staying home for Labor day too. We have work we do on the house and it's nice to hang around. Great photos Jenni!! I can't wait to see what you do with your kitchen!! Yes, yes, I would love that kitchen, especially the red cabinets! !